Cheltenham is truly home to people from all walks of life: shopaholics, art and history enthusiasts, music lovers, families and even health buffs! 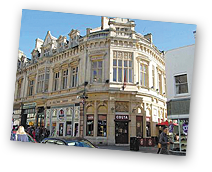 Cheltenham does not only offer great places to walk around, learn, relax and shop, it also offers several avenues to stay fit and active while also taking a break from the stresses of the city. Not only does the Standford Park Lido have the biggest Olympic-sized swimming pool for all the swimmers out there, Cheltenham also hosts half marathons to keep the heart and body happy and healthy. Cheltenham’s famous half marathon runs through the heart of the Regent backdrop that is the town of Cheltenham. The marathon is designed not only for people to keep in shape and stay active, but to also show off the town’s splendour and Cotswold beauty. The Half marathon have been going on annually for the past five years, and every year, the participation has expanded immensely not only among the citizens of the city but even to fitness enthusiasts all across the UK. It is now hosted at the Cheltenham Racecourse. For 2017, the organizers have decided to take all the participants into a 13.1-mile-long journey that begins at the very heart of races, the iconic Racecourse and proceeds into a different direction towards Prestbury. From there, runners can experience the beauty of the town of Cheltenham through a run through the town through Central Cheltenham, Montpellier and Lansdown. The race then proceeds towards Honeybourne line, where people will get to experience running through the tree-lined walks and enjoy the shades they can offer. It goes back to the Pittville area and finally back to the Racecourse where the finish line is waiting for everyone.